The technician says goodbye after three years leading a franchise in a deep crisis. He already has suitors: Kings and Cavaliers. It's over: Luke Walton has stopped being trainer of Los Angeles Lakers. A movement that seemed sung, and that had ruminated during all the season, but that was put in doubt after the exit of Magic Johnson, that was clear that he wanted another coach. The owner Jeanie Buss, great supporter of Walton, has finally agreed to a change in the bench that already has favorites: Tyronn Lue, champion in 2016 with the LeBron Cavaliers James (whose environment never completely accepted Walton) and Monty Williams , now assistant in the Sixers. Walton (39 years old) arrived from the organizational chart of Steve Kerr in the Warriors with the aim of completely renewing a few Lakers adrift. Californian by birth and son of the legendary Bill Walton, he was endorsed by the success of the Warriors and his pedigree laker: drafteado with the number 32 in 2003 (the draft of LeBron James) won the rings of 2009 and 2010 with the team of Kobe Bryant and Pau Gasol. However, goes after three seasons (2016-19) in which he has not reached 40% of victories, 98-148 in 246 games. Not everything is his fault, according to his predecessors: Mike D'Antoni had a 43.5% victory in a two-year stretch (2012-14) and Byron Scott, a sad 22.7% in two others (2014 -16) . 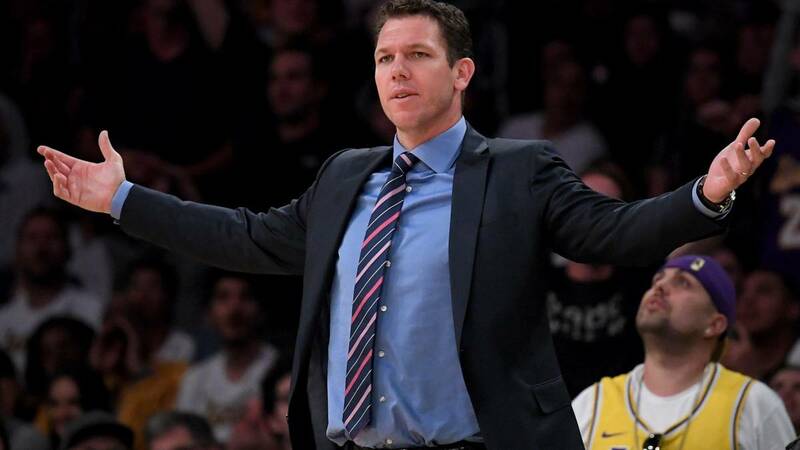 Nothing has gone well in a damn season to the Lakers and the figure of Walton seemed literally burned: after a bad start leaked a row of Magic Johnson, who did not consider Walton his coach as he inherited it from the team previous manager (Jim Buss, Mitch Kupchak). The environment of LeBron James also never gave him his blessing and the team ended with a depressing 37-45 (only two more victories than the previous season) after a biblical plague of injuries. In the official statement is spoken of exit "by mutual agreement" between Lakers and Walton, which goes without putting in playoffs to a team that will see for the sixth consecutive year the qualifiers by television. In all its previous history (1948-2013) he had only stayed five times in total outside the fight for the title and only once had he been out once in consecutive seasons (1975 and 76) . Walton already has suitors: Sacramento Kings and Cleveland Cavaliers have already been placed by the press as possible new destinations for young technician. Meanwhile, there are already favorites to take care of the mess of the Lakers: Monty Williams, assistant of the Sixers and who trained in New Orleans between 2010 and 2015 and Tyronn, the obvious name since he won dos rings as a player with the Lakers (2000 and 2001) and one as head coach of the LeBron James Cavaliers (2016), with whom he maintained an excellent relationship in the Ohio franchise. While this movement was made public, the Pelicans announced the signing of David Griffin as president of operations. Griffin was another name that had been linked with the Lakers, and the manager of the champion team in Cleveland with Lue and LeBron. Without Magic Johnson and with Rob Pelinka still on board as general manager, although his position seems delicate from the outside, the Angelenos have to look for a strong name to take charge of their offices, now with Griffin out of the pools. And a new coach, of course. Everything to do.